From the mainland to Maui this native Cincinnatian has found a home here on the gorgeous Valley Isle. Sutee started his career with Billy Casper Golf in 2003 and hasn’t looked back since. As a proud graduate of Ohio University this Bobcat shares golf experience from the Midwest to the Pacific Islands. Whether it’s working for the legends of golf during the Ka'anapali Champions Skins Game or helping the ladies of Big Break Kaanapali, Sutee is adverse to all kinds of tournament atmospheres. One of his highlights includes caddying for Big Break Ka'anapali runner-up, Sophie Sandolo in the season finale. Sutee’s teaching philosophy is to fit the swing to the student. All good things start with sound golf fundamentals and from there is a fun ride with good communication. Sutee encourages everybody to enjoy the beautiful surroundings of learning golf on Maui. 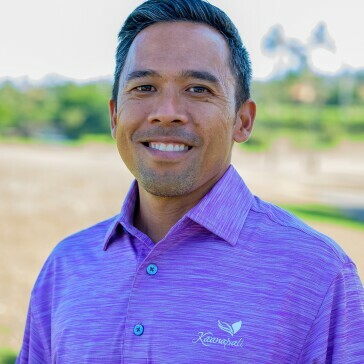 His experience includes a trip to the 2008 Kapalua Teaching Summit studying under the likes of Jim Flick, Mike Malaska, and Mike Adams to name a few. Sutee has also had the privilege of teaching in workshops for golfers with adaptive disabilities and children with special needs. So if you ever visit Ka'anapali Golf Courses please stop by and enjoy your golfing experience on Maui! Call 808.661.3691 x1845 or email.